This past weekend Jason and I ran the Cape Cod Beer Race to the Pint 10k to benefit the Cape Wellness Collaborative. A 10k race (hard to find!) at our local brewery with a bunch of our run club friends – this one was a no brainer! First of all, you couldn’t beat the price! For $30 we got a timed 10k race (there was a 5k option), a long sleeve tech t-shirt, a Cape Cod Beer pint glass AND a free beer at the end of the race! I should preface this recap by telling you that I left my phone in the car, so I literally have NO race pictures! So unlike me, but I’ve been wanting to get an idea of where I am fitness wise so I figured I’d leave the phone and focus on actually running! I convinced Jason (who has gotten quite speedy!) and our friend Pat to run together and run for time as well, so I was on my own! The race overall was well organized, we grabbed our bibs at about 3:15 for the 4pm start, dropped everything back in the car and hung out there until it was time for the anthem. The start was pretty crowded since the 5k & 10k started together and there was a bit of a hill towards the end of that first mile, but between 8:30-8:45 was around where I had hoped to be. Oops, a little too quick! Not sure sure I could keep up that pace for another 4 miles! That’s better. Just about halfway done and honestly I have no idea at all if I can keep up this pace for another 3 miles, but we’ll give it a shot! Repeating the same loop and there’s that darn hill again! Slowed down towards the top of the hill when lunch threatened to make a repeat appearance (seriously, when do you eat for a 4pm race?!? Apparently 12:30 was too late!). Spotted Jason & Pat on an out and back portion and they look great! I’m glad Jason’s finally running a race at his pace instead of always wanting to run with me, he’s capable of much faster times than I am! 1 mile to go! I really want to push it harder, but decided I’d rather finish without throwing up lunch! I picked off a few people the last mile (don’t you love that!) and came into the finish line with Jason, Pat and a bunch of our run club friends who were either just spectating or had run the 5k cheering! 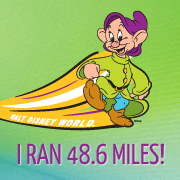 Definitely a pretty big PR for me, both from my previous 10k races (I’ve only run 1 non-Disney 10k before) and from my 10k split during a faster half marathon. AND 3rd place in my age group?! Haha, that just goes to show you how small of a race this was! But, I did get a set of Cape Cod Beer coasters as a prize! Oh, and my friend Jen was the first overall female! She is SO speedy! Jason finished 22nd overall with a time of 47:23! I really can’t wait to see what he can do at our upcoming half marathon, he is going to KILL his previous time. After the race we got our free beer and hung out at the brewery. They had tomato soup and bread which totally hit the spot because it was actually a pretty chilly day! This was a great local race and it was fun to have a group of friends there. I can definitely say even though Jason and I will be in Boston next year at this time we’ll do our best to make an effort to come back for this race if they do it again next year! Now time to get training for a half marathon PR! Have you ever run a race at a brewery? We have brewery and vineyard races around North Texas, and I think the vineyard races would be fun. I don’t drink beer but I do drink wine.